Dickies, one of the most fundamental U.S. clothing brands, has evolved from office and factory stalwart to become first the uniform of skater-punks and now the envy of high fashion through a collaboration with designers Opening Ceremony. Dickies’s chief archivist Ann Richardson, who started working in Williamson-Dickie Manufacturing’s merchandising department in 1970, remembers when Dickies’ primary focus was to make tough workwear that was designed not to draw attention to itself, while managing to embody American durability. As the company’s longest-tenured employee, now approaching 50 years, Richardson has seen one of the most fundamental U.S. clothing brands evolve from office and factory stalwart to become first the uniform of skater-punks and now, the envy of high fashion. These days, celebrities from Justin Bieber to A$AP Rocky are wearing a collection she shepherded to appear in a line from uber-trendy fashion designers Opening Ceremony and offered in some of the country’s trendiest shops. The clothing line, released this past spring, includes over-shirts, twill pants and carpenter jeans dressed up in Opening Ceremony colors: pink, white and various fades. They retail for $150-$250, much higher than the average Dickies item. The pieces are a bit oversized and blend the aesthetics of Dickies — basic colors, thick cuts and zero frills — with the edgy chic of Opening Ceremony. They’ve also been successful: Opening Ceremony is the top retail partner in the Dickies 1922 line, both domestically and abroad. It’s been a long road to get here. Since its inception in 1922, Dickies quietly put its stamp on American culture through reliable, enduring clothing that was never really fashionable, but embodied a hard day’s work and a certain quality of American life. Through the late 1980s and ’90s, that vibe began to shift to the skateboarding world, as riders found the durability of the Fort Worth, Texas-based brand’s pants essential to their sport. The pants were readily available, inexpensive and became something of a symbol of authenticity in that community. 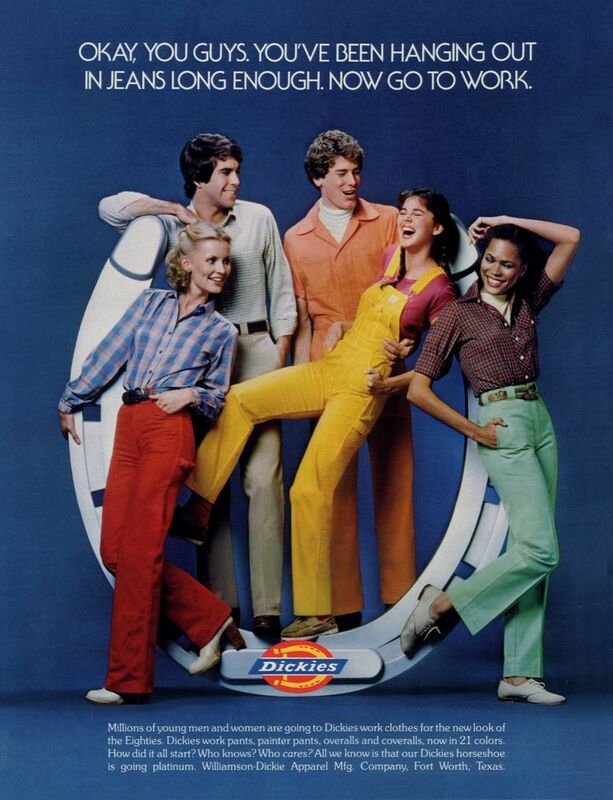 As Dickies churned along, the company recognized it needed to reinvent itself. The American workforce’s needs were changing, and the skateboarding base was getting older, or moving on to other brands. At one of Sheedy’s first meetings at the company, an idea was conceived to start a specialized, collaborative brand within Dickies: “Dickies 1922.” The concept would focus on reviving important pieces from Dickies’ history, bringing them back to life through new interpretations — mainly via innovative collaborations with trendy and fashion-literate partners. As the main custodian of the company’s history, Richardson would oversee the project. At the start, Dickies worked with small, regional clothiers such as New York’s Hickoree’s on re-imagined jackets, shirts and pants with styles from as far back as the 1930s. The company also worked with Palmer Trading on a series of concepts, a collaboration that recently ended. And in 2012, Dickies collaborated with J. Crew on an update collection that proved popular. “1922 has helped us get to other customers in other markets,” Sheedy says. The joint effort with Opening Ceremony came about when the two teams met at a trade show in 2014 and began discussing how to blend Dickies’ unassuming, durable reputation with Opening Ceremony’s high-fashion, high-price-point aesthetic. At first glance, bridging the gap between the two would seem a difficult proposition, but the partnership is said to have been seamless. With Leon at the helm on OC’s side and the 70-year-old Richardson running point for Dickies, they built a collection that’s taken off in both the hipster and celebrity worlds. Although Dickies doesn’t disclose sales figures, it notes that the collections have grown with each season, in keeping with demand. “I don’t think you ever know if these things will take off, but Opening Ceremony is very tuned in to their customer — and a strong leader in their business,” Richardson says. By all accounts, it’s broadened Dickies’s reach. After a positive reception from style magazines and the blogosphere, as well as a sudden embrace of some of the company’s original styles, Dickies finds itself centered in the fashion conversation while still serving its original constituency. Long family-owned, Dickies was recently purchased for $820 million by publicly traded clothing conglomerate VF Corp., whose constellation of brands includes Nautica sportswear, North Face, Wrangler jeans and Vans shoes. VF sees an opportunity in workwear, and Dickies’s revitalization spelled growth to its new owners.